1.Hamlet's conversation with the ghost of his dead father is echoed in the conversation between Liet Kynes and the ghost of his dead father Pardot Kynes. 2.Alia geting captured just to kill to kill the Baron is similar how from wikipedia "knight named Miloš Obilić, pretended to desert to the Turkish forces. When he was brought before Murad, Obilić pulled out a hidden dagger and killed the Sultan by stabbing him in the neck and heart. " 1.Paul is Messiah to Fremen that should make live better but he only makes more trouble just like Hitler to Germany.There's a scene where he compares himself to Hitler — "He killed more than six million. Pretty good for those days... Statistics: at a conservative estimate, I've killed sixty-one billion, sterilized ninety planets, completely demoralized five hundred others. I've wiped out the followers of forty religions..."
Sandworm is most likely inspired by ,,The Mongolian death worm"
Re: Inspirations for Dune saga! Lawrence of Arabia would've been fresh on everyone's mind in the early 1960s, and there are some superficial resemblances between the movie and the story. 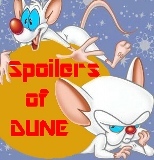 Like the movie, Dune tells the story of a civilized man who goes 'native', wins the trust of the savage inhabitants of the desert, and exploits their unique skills; their self-reliance, their fierce disregard for death, for his own military purposes. There's also a degree of moral ambiguity to Lawrence of Arabia; at the very beginning, the British are shown as the good guys, but later on in the movie, it is revealed that from the perspective of the Arabs, they are not so different from the hated Ottomans; in the end, they are just another oppressor. I think more likely the Hobbit. This is a great catch, I admit this never occurred to me. It does seem like more than a coincidence, since Shaddam makes it quite clear that there is no distinction between the authority of his throne and the size of his army. Naive mind wrote: Lawrence of Arabia would've been fresh on everyone's mind in the early 1960s, and there are some superficial resemblances between the movie and the story. Like the movie, Dune tells the story of a civilized man who goes 'native', wins the trust of the savage inhabitants of the desert, and exploits their unique skills; their self-reliance, their fierce disregard for death, for his own military purposes. As it happens I watched Lawrence of Arabia a couple of days ago, inspired by reading the series again. I also bought T.E. Lawrence's Seven Pillars of Wisdom a couple of months ago, with the intention of reading it after I get through to the end of Chapterhouse. I think the parallels between Lawrence of Arabia and Dune are so striking that it must have been a great influence. Quiet-mannered young man, heavily schooled and with little real-world experience is thrust into an exotic place with people who seem at first to be primitive but are deceptively effective (the Bedouins vs the Fremen). The young man takes up the cause of the people, even to the point of raising it above his previous loyalties, and befriends a chief among them. He has many successes, single-handedly turning the tide for them, then has a period of pause and doubt; for Lawrence, his disillusionment back in Cairo when he puts back on the British uniform; for Paul, the weeks in a coma after taking the WoL. Both of them come out of their trance stronger than ever and focusing on winning. There is even the physical resemblance between O'Toole and Paul, both having slim, wiry builds, lacking the body fat/moisture of their homeland but still not as lean as the Fremen/Bedouins. There is even an emphasis in both stories of the wisdom of an Islamic-type people, over the mores and ways of Christian nations that dominate English literature. And this is to say nothing of the desert setting, the emphasis on the harsh desert life, on the dangers of the environment, on water, on the visual effects of the desert, and on the need to adopt the local attire because it works (stillsuit vs Bedouin robes). Riding a camel even has something in common with the uneven steps of Fremen on the desert, as the camel is something of an ungraceful animal. There is more, but this is enough. The concepts are all Frank's, and the interest in desert ecology no doubt came from his studies into dune encroachment, but I'd be willing to attribute the lion's share of the inspiration for Frank's setting to Lawrence of Arabia.